PROVIDING stab-proof vests to frontline hospital staff is a bandaid solution that doesn’t deal with the underlying issues that lead to violence in emergency departments says Australian Medical Association (AMA) WA. The State Government has announced anti-stab vests and duress alarms will be distributed to WA’s major hospitals to protect frontline staff against rising rates of violence. More than 11,000 incidents of violence and aggression in the health system were reported in 2016-17. AMA WA emergency department spokesman David Mountain said the state needed more hospital beds dedicated to mentally ill or violent people. “Providing stab-proof vests is dealing with one symptom of a major problem and not the underlying issue,” Dr Mountain said. “The State Government does not want to deal with the underlying issue because it will take time, thought and significant resources. The State Government said $2.2 million would go towards protective equipment for frontline health and security staff at the state’s major hospitals, and other at-risk public health workers across the state would be announced in the 2018-19 State Budget. Over the next three years, WA Health will purchase 250 anti-stab vests and 2500 personal mobile duress alarms to reduce the risk of injury at home visits and to help protect staff in remote nursing posts. Health Minister Roger Cook said hospital staff had a right to feel safe in their workplace. “The provision of protective equipment in the form of anti-stab vests and duress alarms is an unfortunate but necessary precaution given the levels of violence and aggression being reported across our health system, particularly in our hospital emergency departments,” he said. United Voice WA assistant secretary Pat O’Donnell said violence in hospitals was a significant concern. 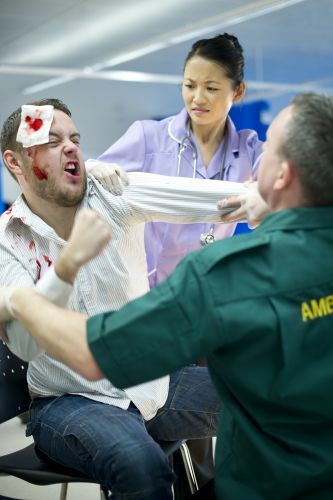 “United Voice supports any measures that provide better safety to hospital workers,” he said.“While it is not possible to remove violent incidents from occurring altogether any measures that minimise the likelihood of an incidence occurring are important to our members.